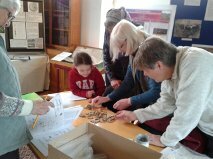 Tuesday 9th April was a great day – although the weather was dull and overcast, from 10 o’clock onwards we had a steady stream of visitors carrying bags and boxes full of finds which were quickly pounced on by the project team. Will Cumber was the first to bring in some finds – a nice selection of Roman fine ware pottery he had found in his garden. A number of local children had spent time digging in their gardens and proudly displayed their treasures of clay pipes, fossils and broken pottery. Two brought in flints which we were able to tell them were probably worked by people in the Iron Age some two and a half thousand years ago – a very long time ago if you are only eight! 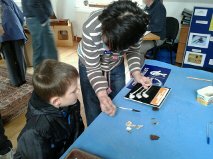 We saw everything from Roman coins and medieval lead tokens to a selection of Roman, medieval and Victorian pottery. A number of Victorian glass bottles, including a very nice glass inkwell came in, hinting at a possible Victorian dump somewhere nearby. Other finds were more remarkable, including a carved carnelian intaglio gemstone found in a nearby garden. A flint blade and a fragment of a polished stone axe, both Neolithic (4000-2500 BC), gave us the earliest evidence we have so far for people in the Marcham landscape, while a vertebrae from an ichthyosaur, a giant marine reptile which lived between 250-90 million years ago, was the oldest object brought in. Although not strictly archaeological it added to the story of the area and showed that Marcham was once under the sea. Word of the finds day had spread and people also brought finds in from further afield, including East Haney, Wantage, Abingdon, Garford, Fawley, Great Coxwell and Letcombe Bassett. 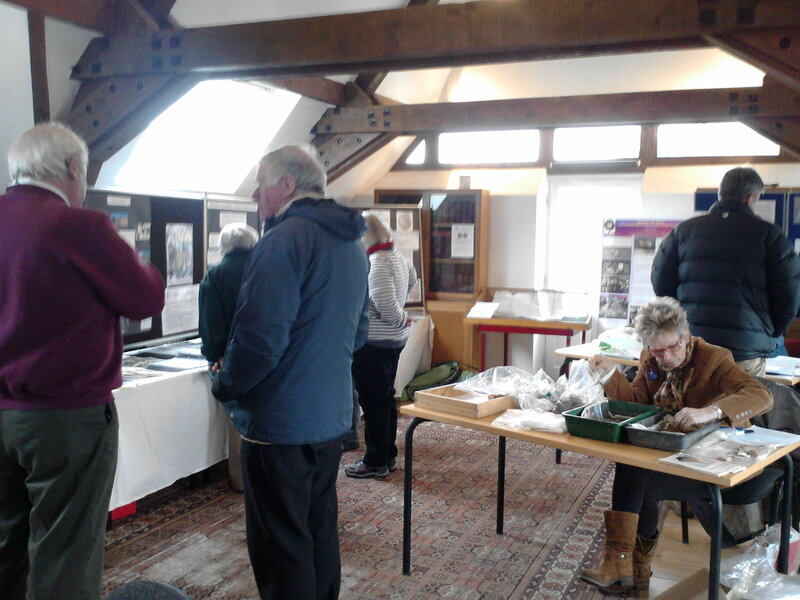 Other interested visitors came to see our display of finds from the Trendles excavations and our information boards, and took the opportunity to chat to some of the Trendles Project volunteers who were busily working away on pottery, bone and stratigraphy. We were also joined for the day by members of the Marcham Society who had some of their wonderful collection of photographs and historic documents on display. We have retained a few of the more mysterious items, including a beautifully-made copper alloy decorated clip with a punched dot and ring decoration which might be medieval. We will do some further research on this and will hopefully be able to pass it back to the owner with some more detailed information. 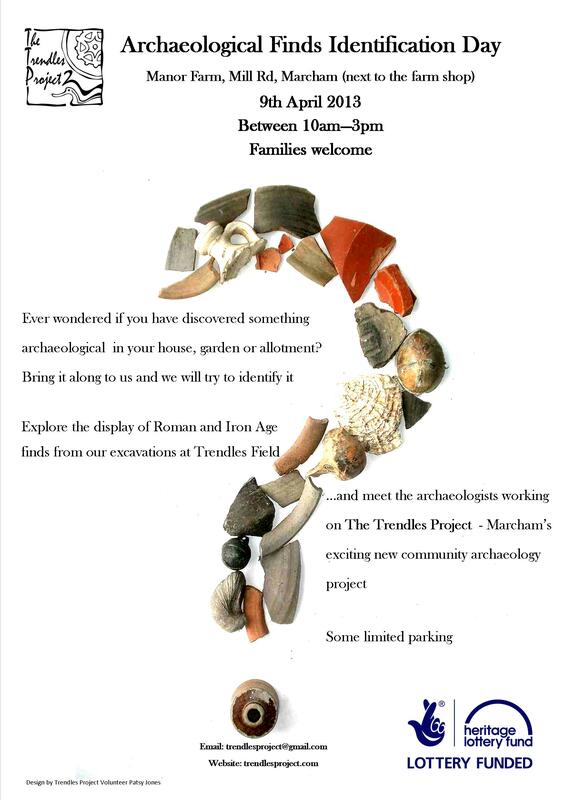 We were delighted to be invited to hold the Finds Day in the Boardroom at Manor Farm; what a contrast to the many open days we held in July in the wind and rain during Dig years.